Let’s talk Fall. Our weather keeps flirting with cooler temps and then decides to warm up again. So getting dressed in the morning is always a challenge. While I don’t want to be bundled up, I do want to look like I am wearing the right thing for the right season. Pulling in Fall colors and warm tones helps with that. 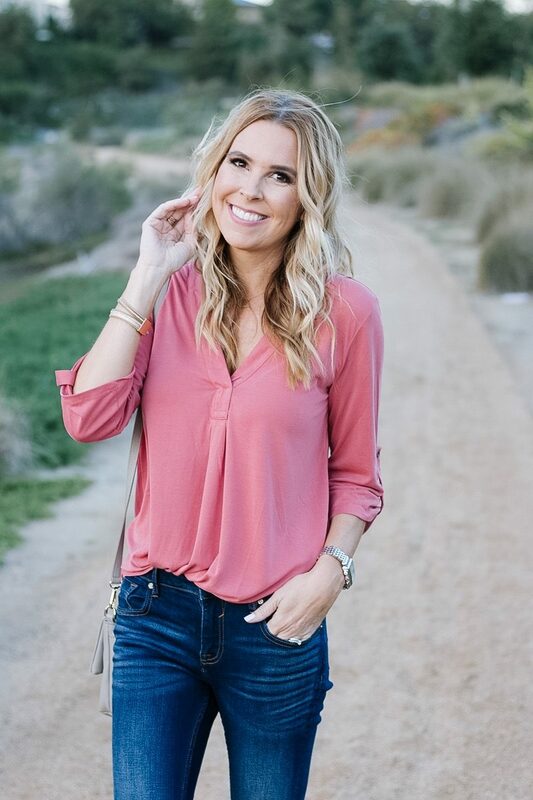 Today I am sharing one of my favorite Fall tops. It’s incredibly soft and a fantastic addition to your Fall wardrobe. Ladies, this top is crazy soft. It fits so well and is a gorgeous color. It’s a bit warmer and more of a pumpkin tone in person. We caught the last light of the day and it makes it appear a tad more pink than it is. The nice thing is that it’s only $39 and comes in 8 different colors. And every color would look great with this leopard flats. I’ve had many questions about these. Yes, they are very comfortable. They have been my go-to flat lately and add so much to every outfit. They are true to size. What I like about this blouse is that you can dress it up or down. It would look beautiful with a pencil skirt or pencil pant for work or luncheon. It also looks so pretty with this soft cardigan. Try as you might, you can’t get me to quit my neutral crossbody bag. Love it so much. Plus it goes with EVERYTHING. The Jeans are Vigoss and extremely comfortable. Here is a more true version of my top. No matter how much I lightened or darkened the photo it still looked pink. My apologies. I think I need better editing skills. But at least you can see it’s a warmer pumpkin spice color (as I like to call it). Also really like the black and ashes of rose colors. So pretty. The top I am wearing is a soft cotton, but this other version is also a great option. The only difference is that it is a bit lighter and more of your typical blouse fabric. It is on sale for $24 in all colors!!! Just a heads up that you can receive 25% off your order during the Friends & Family event at Colleen Rothschild. Thank goodness because I have been out of my cleansing gel for two weeks waiting for this sale. I recently had a friend ask what my top three favorite products are. Hard to choose as they all serve different purposes. But when I run out of these three I get in panic mode. Love these and they are a crucial part of my routine. And actually this lotion is a daily must for me, too. Let me know if you have an questions. The code to use is FAMILY25. Today is Tuesday so you know what that means! I am off to see Mama. Hoping and praying it’s a good day. No matter what, I always ask for the strength to meet her right where she is. I’ll keep you posted. Have a really great day. Oh, and I want to thank a few of my readers who have messaged me lately about this chicken noodle soup recipe. It’s super easy and you all have been making it in your own homes. I think I might make it tonight for my family. I always love your recommendations — I got a cross-wrapped gray top you recommended last winter and wear it ALL THE TIME. (So much so one of my best girlfriends actually complained that she was sick of seeing me in it, ha!) Love those leopard flats too — I’ve been on the lookout for a pair that’s comfortable enough and the right price point. Jury’s still out on that one — I’m really picky (and my heels rub SO BAD on so many flats). But maybe I’ll give these a try! You look absolutely gorgeous in these photos! The color, the curls–just so pretty!